FREDERIKSTED, St Croix, USVI — A bomb threat on Delta Airlines on Saturday afternoon, July 15, 2017 forced a temporary evacuation at the Henry E. Rohlsen Airport in St Croix, US Virgin Islands (USVI), according to information provided by 911, which was relayed to The Consortium by [US] Virgin Islands Police Department (VIPD) Public Information Officer Glen Dratte. Mr Dratte said the Virgin Islands Port Authority was leading the investigation and that he could not provide much details. However, he said the call reporting the bomb threat was made at 3:41 P.M., and the VIPD’s K-9 unit aided with the investigation, while the force’s traffic arm worked to reroute traffic away from the airport. It is not clear what was uncovered during the investigation, but VIPA gave the all clear at 5:01 P.M., according to 911. 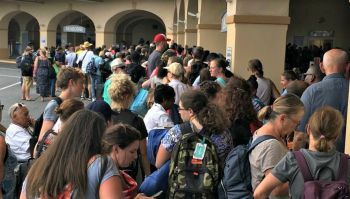 Three airlines — Jetblue, Delta and American — were set to leave St Croix when Port Authority officials initiated the emergency evacuation, according to a person who was boarding the Delta Airlines flight. This person then told The Consortium that passengers were ordered to get off the American and Jetblue flights, along with the Delta plane. “We are all going to have to go back through customs and security, and these flights are going to be really late,” this person said. Though the VIPA gave the all clear came at 5:01, at 4:52 P.M. passengers of Delta Airlines were boarding the plane. Jetblue had already been clear to leave. The Consortium is not sure when the American Airlines flight left. The bomb threat did not only disrupt flights; passengers on the Delta Airlines plane most likely missed their connecting flights. But the threat also came at a cost to the government, whose agencies — the VIPA and VIPD — had to divert already scarce resources to adequately respond to the threat. VIPA has yet to issue a release on the matter.